Say cheese and we in India are most familiar with three kinds. Mozzarella on our omnipresent pizzas. Cottage cheese without which our restaurants would be out of business! The other of course is processed cheese in slices and cubes stacked in the fridge for our white sauce and for the kids' sandwiches. The past decade or so has seen more of cheese with the culinary revolution, increasing popularity and interest in food. We can now safely say we know Parmesan, mascarpone, ricotta, quark, feta, cream cheese and Gorgonzola to name a few, at least by name. They don't sound all that much alien as they pop out of the menus and television shows all the time, we can actually pretend we know them! The availability of exotic varieties of cheese is truly heartening with these dotting the aisles of the newer specialty supermarkets and the virtual aisles of online food stores. But truth be said, the prices kill the joy of buying them! The wallet effect apart, it would not really hurt to run to the near by store and buy a tub of fat free cream cheese for your cheese cake on the way back from work. Thankfully there are at-least some of these which are best consumed fresh - and the making of which need not be a study in itself. Home made ricotta is one of them. Ricotta means 'twice cooked' and is traditionally made using left over whey which is a by-product of cheese making. 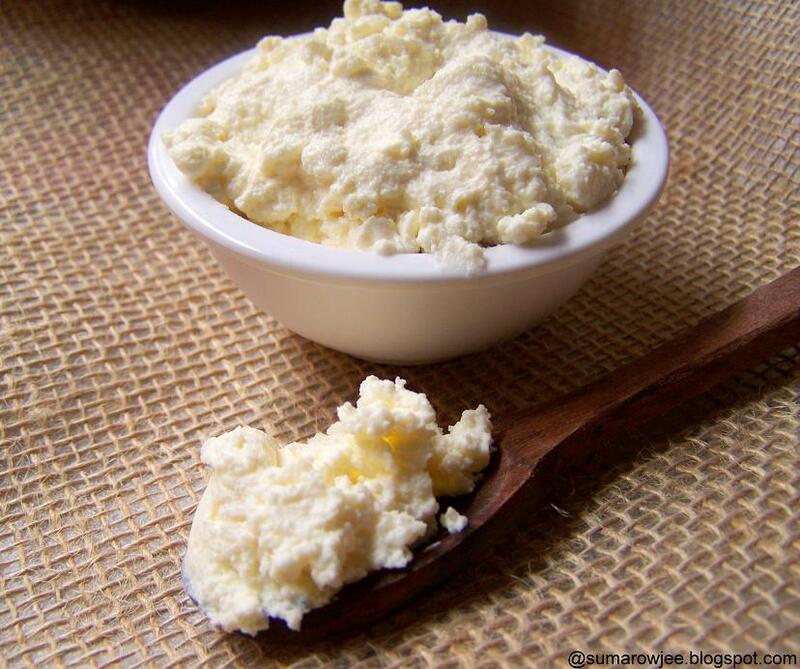 Below is the recipe for homemade ricotta for folk like us who have no access to cheese making by- products. Again homemade ricotta can be made using lemon juice or vinegar or buttermilk to curdle the milk, with obvious subtle difference in taste. It was a joy to discover that ricotta is oh-so-easy-to-make with just a handful of easily available ingredients. When really fresh, it has a very soft and creamy texture. Can be made quickly subject to the availability of whole milk and cream. You could use ricotta in cheesecakes, cakes, muffins, desserts, in your savory tarts or eat just as is with a drizzle of honey and nuts. Delightful soft cheese, ridiculously easy to make, supposedly super versatile in use and very cost effective - who in their right mind will now say no to this cheese! Adapted from here, recipe by David Lebovitz. Position a strainer over a large deep bowl, line with a few layers of cheese cloth. In a medium sized heavy pot, lightly whisk together the milk and cream, tip in the yogurt, vinegar and salt. Bring this to a boil ( I boiled on medium heat). It took about 5 minutes for the milk to rise and the milk to start separating around the edges. Once it comes to a boil (when it rises), boil for another 2 minutes or till the milk curdles. You can now see whey and bits of curd over the surface too. Do not boil for longer as it may make your cheese rubbery. Pour into the lined strainer and drain for 15 minutes. Gather the cheesecloth around the cheese and squeeze gently to drain excess liquid. Guess we have to remember that you if you drain it longer it makes for a drier cheese and you only need to squeeze it gently and not actually wring it dry! 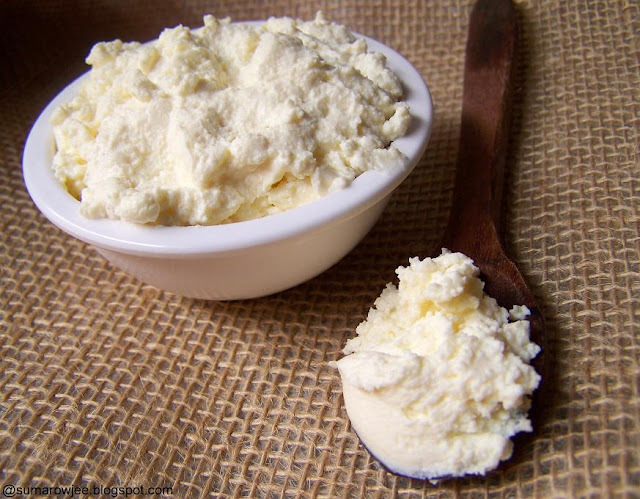 Home made ricotta is best served warm, refrigerated for up to 3 days. Not sure if this freezes well. I actually have some ricotta in my fridge, lets see what I can do with it! Brilliant ! Thank you so much for this recipe. Thx a lot for the detailed tips Suma.....you saved my day! !....this is what I had been looking for since past week.....I had attempted ricotta earlier, but it turned out rubbery instead of soft....now I knw why?! !...your tips are spot-on.....Hope to replicate your Ricotta's creamy texture....thx...thx...thx!! Totally get you. The price is definitely a turn off. And one never knows whether the cheese has been stored properly..so many stores are careless with refrigeration. Can't wait to see what you're gonna bake up with this soft cheese! wow.. this looks so nice and it is easy to make..will surely give it a try soon..
and I had been ignoring them. It is not available in the stores here and I didn't know that it was possible to make it at home. Now going back to the bookmarked recipes using ricotta. Thank You for making it so easy! Ha ha, I too can 'pretend' to know these cheeses, been wanting to make ricotta for some time now, you've inspired me! How about using them in some spinach-cheese patties for using inside pita bread? 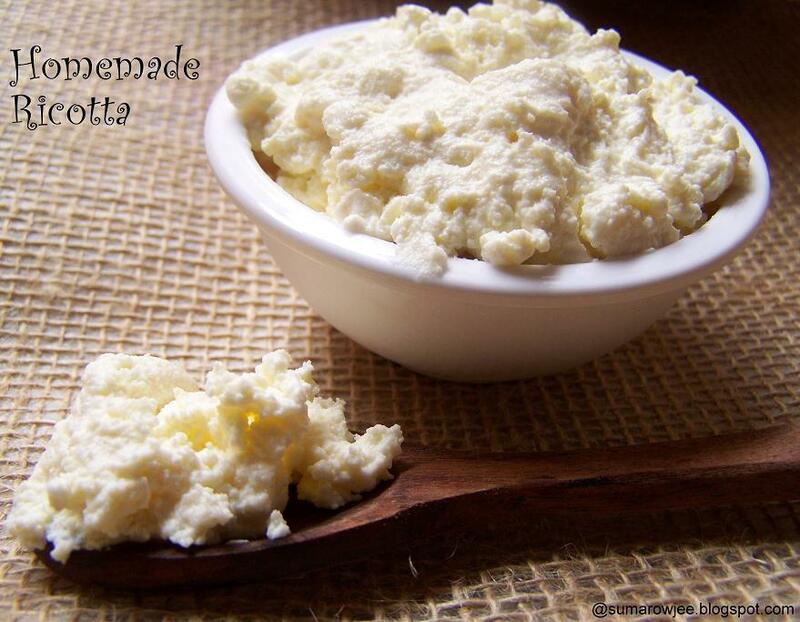 Ricotta cheese, we get them easily here, can guess how few of your followers will definitely love this post. Dnt knw if u r checking new comments on yeast mail...very informative post...actually ive tried every yeast available in market mainly dry active yeast powder but none of them worked for me..as u said said gloripan is gud...wanted to knw..if i buy a bulk packet 500gm which available at cheap price online..will it last long in my freezer..?? ?or will it a waste of money..?? I am curious to try homemade ricotta. The idea is new and attractive to cook. I just excited to combine few new India Recipes in my cooking gem. Wow! Homemade cheese. Yum Suma. I m yet to give this a try. Hey! Great post! I just had one question - when you say cheese cloth, what exactly are you referring to? Can muslin be used? I've tried looking for cheese cloth and shop owners do not understand what it means. Thanks. @Richa - A cheesecloth is basically cloth with the fabric woven loosely, drains the liquid, but holds together the solids. Anything which helps u do this should work fine!